Warbird Information Exchange • View topic - Spitfire TE308 - low back. Spitfire TE308 - low back. Post subject: Spitfire TE308 - low back. Post subject: Re: Spitfire TE308 - low back. Thanks for posting this picture PeterA! PeterA When was your black + white photo taken? 1950 or prior? Thanks for posting that photo Peter. With the recent return to flight of Mk XVI TE311 being only 3 serial #s from the machine in question, how were the differences in Mk #s determined. Was it just whether a RR or a Packard merlin happened to come out of the engine crate, or is this just a close sampling of batch #s? Paul - Peter's photo has to be before re-purchase by Vickers-Supermarine for conversion to the two-seat trainer. The profiles are fun! You want to change the sand/brown to brown/green for the Battle of Britain film era and until it got the grey/green though. "Switch on the underwater landing lights"
Yeah... The photo I saw had a "blue" tint to it. Hard to tell what the colors were. 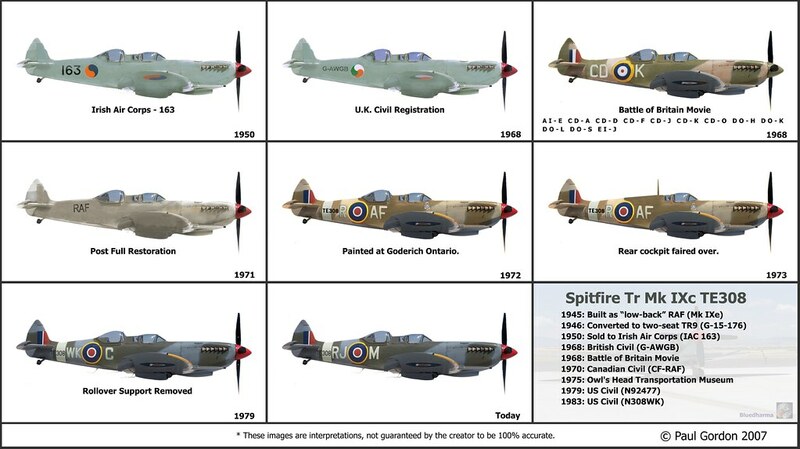 The colours on the British fighters in the Battle of Britain film were the period correct 1940 'Dark Earth' and 'Dark Green', over a simplified 'Sky' underside (there were several underside colour changes in the Battle) and heavily weathered, inspired by the schemes from the film's large scale models. Unit codes were white (often dirtied up) serial black, three colour roundel under the wing (narrower blue ring than your representation) and fin flash, which is correct, as is your fuselage roundel. The upper wing roundel was dull red/blue. A very subtle point most miss is the correct upper camouflage demarcation lines were adjusted from the correct ones to ensure a single colour behind each code letter, rather than having two colours there as per the correct layout. The reason being to help with managing the replaceable letters. I suspect then the line under the 'D' in your illustration should be further forward, touching the roundel's edge. Thanks... I made this back in 2007... Think it is time for an update now that I know a little more about the aircraft. Here is a copy of the photo (from somewhere in NL) that I tried to work with. Yes, the "D" is touching the roundel. I may not have been quote clear enough - I was referring to the demarcation lines between the green and the brown; the filmmakers chose to have each code letter on one colour (green or brown) and avoid a demarcation line going through behind the letters, as it should be in the correct Air Min Spitfire camouflage pattern. So the 'D' should be entirely on green or brown (nothing to do with the relationship to the roundel). Having said that, it seems that the two seater scheme may not have allowed enough width for each stripe of the green or brown as the letters ended up - it's not clear in the shots I have to hand. There's a couple of good shots in my late friend Robert Rudhall's 'Battle of Britain - The Movie' book of TE308, and it's worth noting that it flew without the forward sliding canopy on occasion (for dummy parachute drops I believe - PeterA may have better info) and most of the period with a Hispano Buchon film style prop, with the cropped spinner representing the 109E type spinner. I mention these things because there's a myth-building cycle with colour profiles; artists make them with the best intentions and best information they have, but naturally fill gaps of knowledge with best guess. This is then taken by people who ought to know better as 'evidence' the aircraft's scheme was as depicted by the guesswork in the profile. As you may appreciate, the profile artists who work on our books get a harder set of checks and corrections by me than they sometimes get elsewhere, but even so we can still make mistakes. Hence the (I hope) constructive critique! It can't have been random pick next in line engine as the there are fuselage firewall differences re header tank for the intercooler. Serial numbers at this time are not a precise indicator of build order. Studying first flight dates at Castle Bromwich you can see a batch of 30 Mk XVI's followed by randon mixed Mk IX's and XVI's as singletons and batches of three to five. Castle Bromwich at this time was gearing up and producing the mighty Mk 22 Griffon Spitfire. The last Mk IX production was completed by Cosford and Desford, shadow facilities to CBAF. Thanks for the education Peter and the glimpse of TE308 in her original state! The image was taken at 39 Maintenance Unit at RAF Colerne in 1949 and is published full frame in 'the book' and is adjacent to TE309. So with no service history and placed in long term storage, why were the roundels changed? One possibility is that both TE308 and TE309 were earmarked for sale to a Foreign Air Force. The source of the image, G. Kinghorn, at the time thought the Spitfires were in Egyptian markings! Although the roundels should have the small 'Stars and Crescent' in the centre of the roundel for the Egyptian Air Force, Supermarine were making a strong sales pitch to Egypt at this time. The Egyptians finally purchased the Mk 22...and the IX TRAINER. So a cancelled/changed order to a Foriegn Air Force is a possibilty. TE308 was sold back to Vickers in 1950 for conversion to two seater for the Irish Air Corps and delivered in 1951, belly landing on its arrival delivery flght, image also in the book. TE309 was sold to the South African Air Force. It clearly shows that this has been the passion of your life. You never cease to amaze with your knowledge and reference material. What a brute that Mk 22 is! Oh to know what R.J. would have thought. Seeing his lovely design evolve. ...and continuing the serial sequence downward here is Mk IX TE213/5518 of the SAAF.